Welcome everyone to our lucky number event. Below I will give you a detailed introduction of the products we want to give away. If you plan to change a toothbrush or use a more advanced product like a toothbrush, then our product will be a good choice for your teeth to enjoy the VIP level that you have never enjoyed before. It will be the most intimate and professional assistant of your teeth, and it is also a necessity for cavity hygiene. It can effectively help periodontal health, help teeth heal faster and better fight against bacterial infections. The product uses a high-pressure water stream that “washes” under your teeth and gum lines to remove odorous pathogenic bacteria that protect you from the oral and gingival disease. ★ PROFESSIONAL ASSISTANT: The portable water flosser not only has 360-degree tip rotation to clean all oral areas, the portable water flosser is also packed 4pcs multifunctional jet Nozzles, which is perfect for implants, and those with crowns, bridges, and veneers. 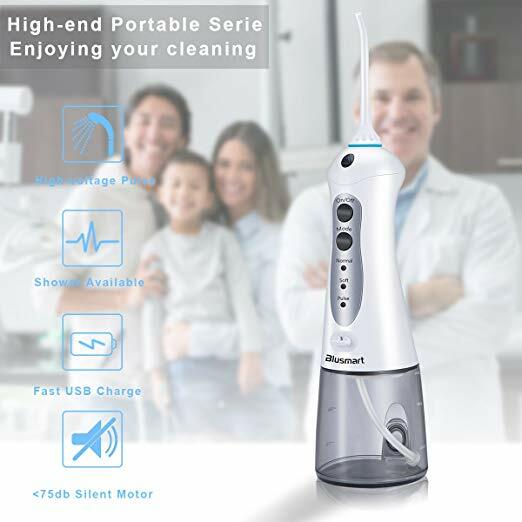 ★ ALL ASPECTS OF FLOOR: Blusmart water flosser, 200ml full OPEN type water tank of 45+ seconds to ensure cleaning without a dead angle, provides 3 modes (Normal, Soft and Pulse) with less than 72 dB muted effect and IPX7 waterproof to make the water flosser work perfectly in your bathroom. 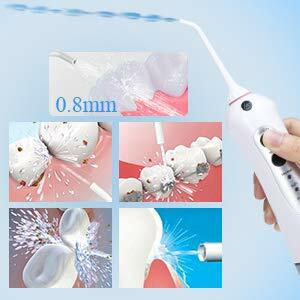 ★ ESSENTIAL FOR ORAL HYGIENE: The water flosser pushes bacteria and food particles out. Blusmart water flosser also effectively helps promote periodontal health by stimulating circulation in your gums, which can help you to heal faster and fight infections better. 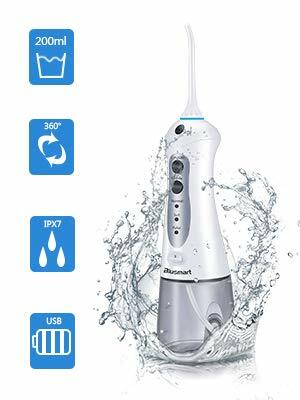 ★ LONG STADY TIME: The rechargeable USB 1400mA water flosser, 4-6 hours for the full charge and 7-10 days of use, is compatible with 100-240VAC, 50/60H to ensure you can use Blusmart water flosser anywhere, which makes your oral care safer more efficient and more environmentally friendly. ★ 100% GUARANTEE: If you have any problems with our water flosser, you can get a 30-day refund or replacement without reasons. And you also can get a 2-year warranty on the water flosser unit. Blusmart water flosser is designed with the 360-degree tip rotation, making it much easier to reach the back of your mouth and the backs of your teeth, which cleans your teeth from A to Z and it is more effective for improving gum health around implants. It is perfect for implants, and those with crowns, bridges, and veneers. We are giving away 10 Blusmart Portable Rechargeable Dental Water Floss to 10 lucky winners. For joining this event, just share this event on your Facebook or Twitter and then take a screenshot and post it. 1. Share this event on your Facebook or Twitter and attach a screenshot of your social post in this blog comments section on the forum, you're automatically enter to this event. 2. we will give away a $40 Blusmart Portable Rechargeable Dental Water Floss to 10 people whose comments land on 18, 48, 88, 168, 288, 358, 438, 488, 538 and 608. 3. You may not post more than 3 times in a row. 5. Your comments, once posted, cannot be deleted. 7. Bulsmart receives the right for final explanation.